Box Text: YOU BETTER GET THEM BEFORE THEY GET YOU! A boisterous band of baboons carry out a daring zoo escape. It's ape anarchy and it's up to YOU to stop the chimps before they make chumps out of the human race! -The first and only game that takes full advantage of the DUAL SHOCK™ analog controller! -Use both analog sticks - rotate 'em, sling 'em back and push 'em down for unequaled and revolutionary controller action! 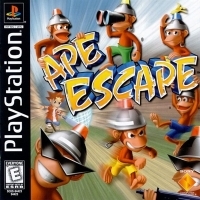 -Hunt down over 200 unruly apes. -Operate great gadgets! A Tank, a Remote Control car, a Stun Club and Time Net, a SkyFlyer, a Slingshot, a Monkey Radar and more! -Bonus rounds, mind-twisting mini games and clock racing time attacks for unbelievable fun. 04-02-2015 Nosmiric Box Text YOU BETTER GET THEM BEFORE THEY GET YOU! A boisterous band of baboons carry out a daring zoo escape. It's ape anarchy and it's up to YOU to stop the chimps before they make chumps out of the human race! -The first and only game that takes full advantage of the DUAL SHOCK™ analog controller! -Use both analog sticks - rotate 'em, sling 'em back and push 'em down for unequaled and revolutionary controller action! 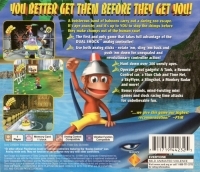 -Hunt down over 200 unruly apes. -Operate great gadgets! A Tank, a Remote Control car, a Stun Club and Time Net, a SkyFlyer, a Slingshot, a Monkey Radar and more! -Bonus rounds, mind-twisting mini games and clock racing time attacks for unbelievable fun. 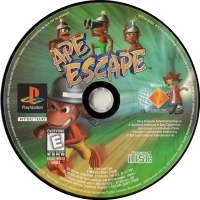 This is a list of VGCollect users who have Ape Escape in their Collection. This is a list of VGCollect users who have Ape Escape in their Sell List. This is a list of VGCollect users who have Ape Escape in their Wish List.